Egypt says Hamas and the outlawed Muslim Brotherhood were behind last year's killing of the country's top prosecutor, Hisham Barakat. Egypt on Sunday accused Hamas and the outlawed Muslim Brotherhood of involvement in last year's killing of the country's top prosecutor, Hisham Barakat. Barakat was killed in June of 2015 when his car was targeted by a bomb in the capital Cairo. On Sunday, reported AFP, Egypt's Interior Minister Magdy Abdel Ghaffar said that 14 members of the Muslim Brotherhood participated directly in the plan to murder Barakat. "This plot was carried out on the orders of the Muslim Brotherhood... in close coordination with Hamas, which played a very important role in the assassination of the chief prosecutor from start to finish," Abdel Ghaffar charged in a conversation with reporters. He added that the 14 people who "directly participated" in the killing were "part of a cell of 48 people who had planned... a big conspiracy" against Egypt. The entire cell of 48 had been arrested, said Abdel Ghaffar. "All those arrested are from the Muslim Brotherhood," he added. Barakat was the most senior government official to be killed since jihadists launched an insurgency following the military overthrow of Islamist president Mohammed Morsi in 2013. He was appointed after Morsi's ouster, and was seen as a staunch opponent of the Islamist opposition, referring thousands of people to trial, noted AFP. The accusations are not the first time that Egypt has accused Hamas of orchestrating terrorist attacks in the country. Egypt began creating a wide buffer zone along the Gaza border in late 2014 in a bid to destroy the hundreds of smuggling tunnels Cairo says are used by Palestinian Arabs to deliver weapons to jihadists who are battling Egyptian forces in the Sinai peninsula. The decision on the buffer zone was made following two deadly attacks in El-Arish, which killed dozens of soldiers and were claimed by Egypt’s deadliest terrorist group, the Islamic State-affiliated Ansar Bayt Al-Maqdis. 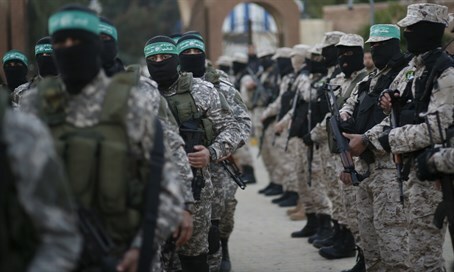 Egyptian sources revealed that Hamas terrorists had provided the weapons for the lethal attacks in El-Arish through one of its smuggling tunnels, a charge which Hamas denies. Hamas also denied Sunday's charges that it was involved in Barakat's assassination. "The accusations against Hamas regarding the assassination of prosecutor general Hisham Barakat are false and run contrary to efforts to strengthen relations between Hamas and Cairo," Hamas spokesman Sami Abu Zuhri was quoted by AFP as having told the movement's Al-Aqsa television channel. Barakat's assassination, which has never been claimed by any group, came as a blow to President Abdel Fattah al-Sisi, the former army chief who overthrew Morsi and won elections in 2014 on a pledge to wipe out Islamists. After ousting Morsi, the authorities began a blistering crackdown on his Muslim Brotherhood movement that has left hundreds of people dead and thousands jailed. Hundreds more have been sentenced to death or lengthy jail terms after speedy mass trials.